Going into the process of using Voyant as an analytical tool, I felt pretty confident. As soon as we began to use the tool, my mind was baffled. Voyant began to confuse me with all the different buttons, searches, highlights, and so forth. The more I began to use it, the more I started to learn a bit about it. Voyant was a program that I have never heard about before, so I did not know what to expect when going into using it. I chose to use the “test corpus” as my text of choice. After uploading it into Voyant, I could not make out what type of text it was. I then took out the stop words from the text, and it began to seem more clear. 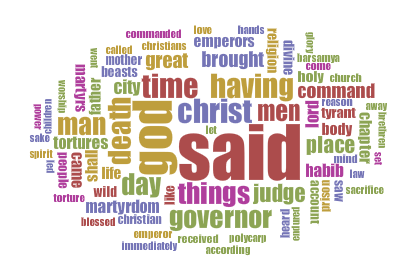 Words that came up quite often, were “God,” and “Christ.” So based upon these words, I began to view it as a religious text. This was pretty much the biggest takeaway I could get from the text. My Voyant skills have not gotten superb yet, so I’m still in the midst of bettering them. Overall, I would say that I have at least gotten a little bit of insight into how Voyant is used. Just by going through it a few times and playing with the different tools, I have gotten better. I still have a bunch of questions about the program, but I’m sure that I will be able to figure them out as the class goes on. I totally agree with you! I had never heard of this program and initially i was super confused as to what it was we were doing and why it mattered that we even used this tool –how it helped us to understand a piece of text. I am familiar now with the program but I definitely don’t know everything. I didn’t use the same text that you did but I was able to narrow down my search. I was already familiar with the Shakespeare plays, not in depth but to some extent to understand the themes. Seeing that some words were more prominent in others was weird and unexpected but that’s the cool thing about this tool. Like you said, i’m not an expert on using this-especially on transferring the pictures/graphs, but its something i’m sure we will all be familiar with by the end. Good job!